Another beautiful end of the summer day in Hatteras. Inshore anglers went out into the Pamlico Sound and experienced some good Drum action! They got on some keeper Drum as well as over slot Drum releases. The Bluefish bite was on again today providing lots of action. 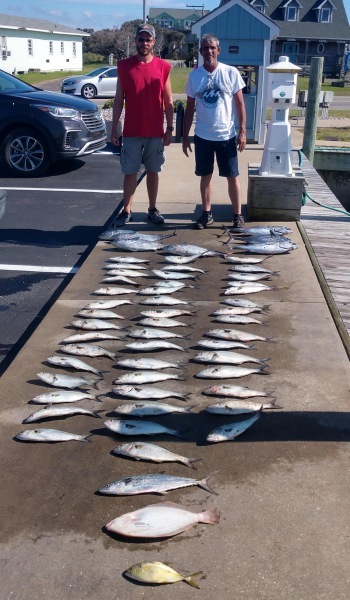 Several offshore boats went out to the Gulf Stream and their catches consisted of King Mackerel, Dolphin, Wahoo, and Blackfin Tuna. Bottom fishing included Amberjack and Triggerfish. The Barracuda bite was good today. 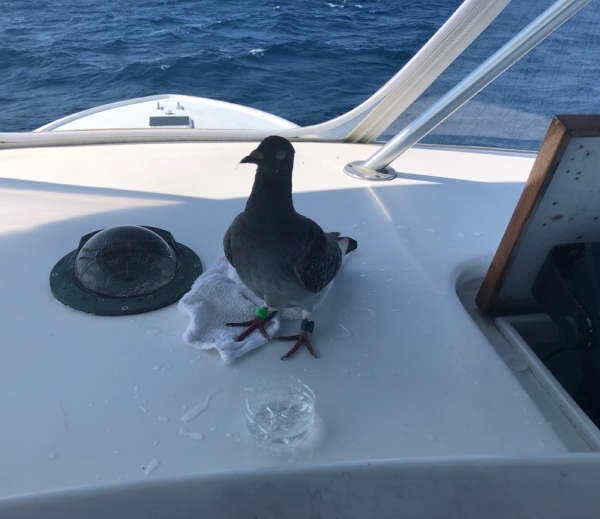 The Release boat entertained an interesting visitor while out to sea. 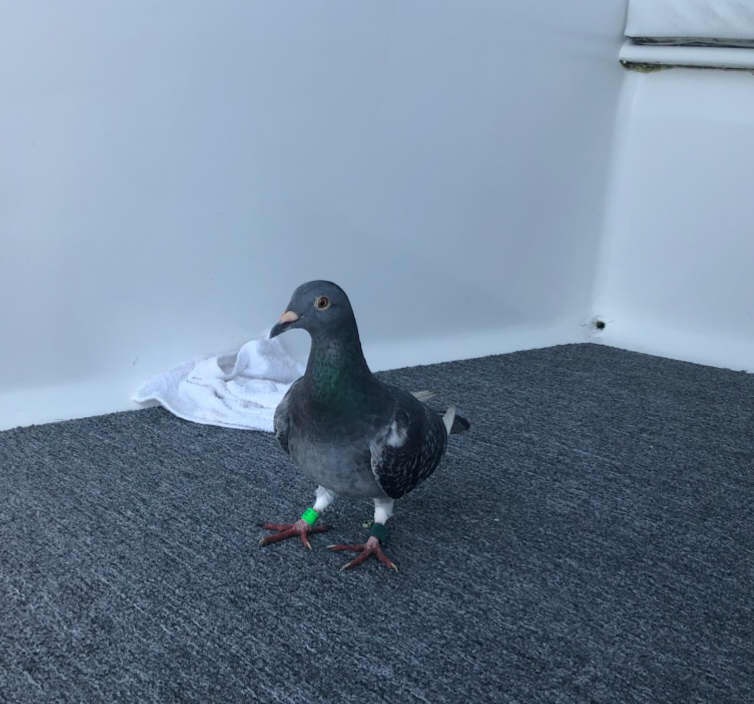 A pigeon landed in the cockpit and stayed on the boat for about four hours - it was fed peanuts along with some water as it rode along resting. Capt. Rom named ir Florence. Check out the pictures. 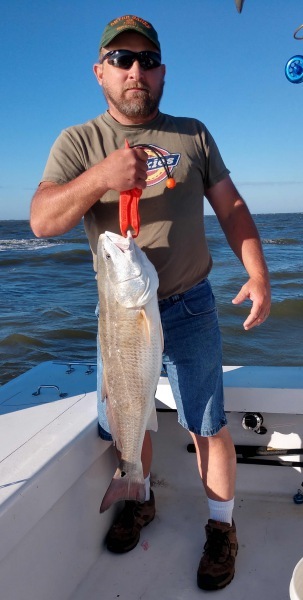 Mike Glynn of Scottsdale, AZ: 47" Red Drum release on Adventure. Bryan McBride of Whispering Pines, NC: 26lb. Blackfin Tuna on Bite Me. Morrissa Barber of Cameron, NC: 45" Barracuda release on Bite Me. 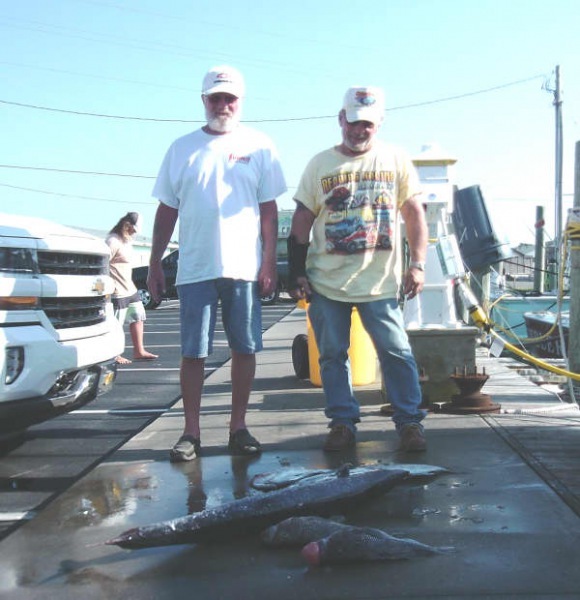 Jim Pinklam of Mooresville, NC: 55" Barracuda release on Bite Me. It was good to see a few of our offshore fleet make it out to the Gulf Stream after Hurricane Florence. They had to locate a safe channel just after the storm passed and managed to mark a safe passage. One Blue Marlin was released. 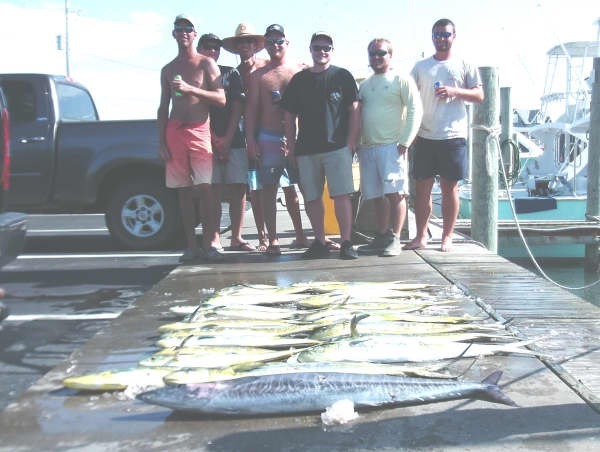 A few Wahoo were caught along with a Dolphin. 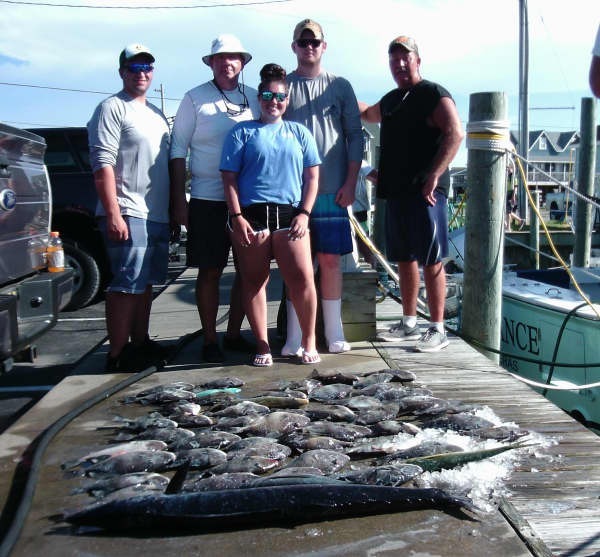 Bottom fishing included Black Sea Bass and Amberjack. The Captains reported a big swell this morning although it calmed down throughout the day. Inshore parties are keeping busy with over slot Drum releases and a good Bluefish bite. It looks to be a pretty weekend and we hope to get folks out on the water! William Scott of Exton, PA: 42 lb. Wahoo on Release. Gorman Horner of Salisbury, MD: Blue Marlin release on Bite Me. A couple of Inshore boats out fishing today. They reported excellent Red Drum with keepers and releases. Weather breezed up in the afternoon but should die down overnight. We hope to see some Offshore boats back in the saddle again in the next few days. Adventure: Red Drum Releases: Byron Jenkins Jr. of Montpelier, VA 46". James Heffler III of Milford, VA 47". Jonathan Wells of Glen Allen, VA 49". Mostly minor wind damage and flooding in Hatteras. The marina will be open Monday 16th provided the roads are clear. We feel for our brothers and sisters south of us who took the brunt of this storm. We wish them a speedy recovery and calm weather. All of our boats have been moved to other locations or have been secured here at the marina. We are praying for everyone in Eastern North Carolina, stay safe. We will be back in a few days. We had lots of Offshore boats headed out today. 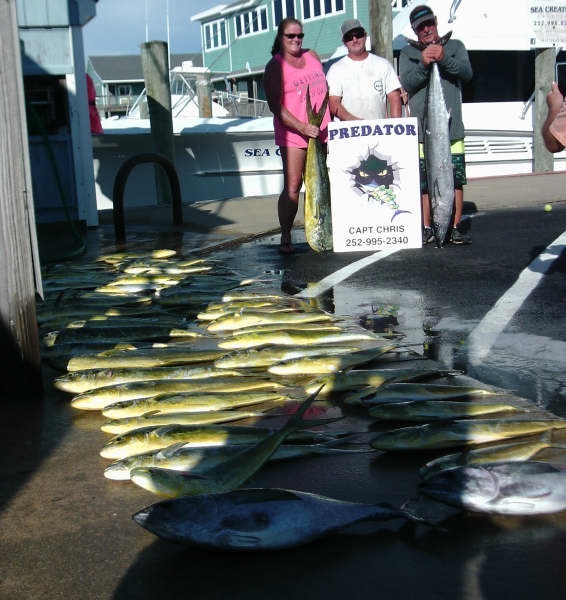 They returned with good catches of Dolphin, Blackfin Tuna and some Wahoo. The boats did return early for the most part because of the mandatory evacuation. There were also a few Sailfish released. Inshore boats found some Red Drum. As of noon today we are under a mandatory evacuation for residents and visitors. We plan to be open tomorrow weather permitting but will not be here later in the week. Please stay safe and dry everyone! 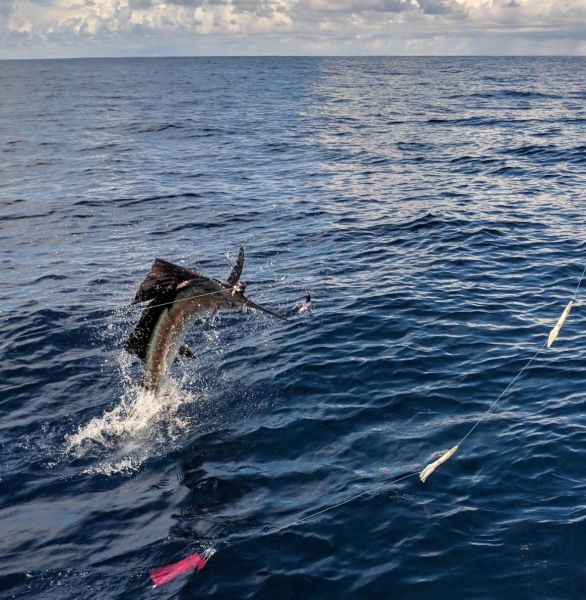 Tuna Duck: Kevin Mitchell of Staunton, VA released a Sailfish. Tightline: Sam Huffstetler of Burlington, NC released 2 46" Red Drum. Predator: Wayne Geddings of Monroe, NC released a Sailfish. Calypso: Jay Skorupski of N. Versailles, PA caught a 52lb Wahoo. Edward Watt of N. Versailles, PA released a Sailfish. Sound Bound: Princess Moody of Dewitt, VA released a 49" Red Drum. Weather continues to be hot and beautiful. Almost all of our boats are booked for tomorrow so it looks to be a banner day. Inshore boats were not running today but Offshore boats were hitting the water. Several fished Offshore and found great catches of Dolphin and some large Wahoo as well as a few Blackfin Tuna and decent Triggerfish. Hatteras Fever: Jordan Wallace of Clayton, NC released a Barracuda. Sea Creature: Raymond Mitchell of Wilmington, DE caught a 42lb Wahoo. Another slick calm day to be out on the water. Inshore parties had a good Bluefish bite as well as good Red Drum fishing. 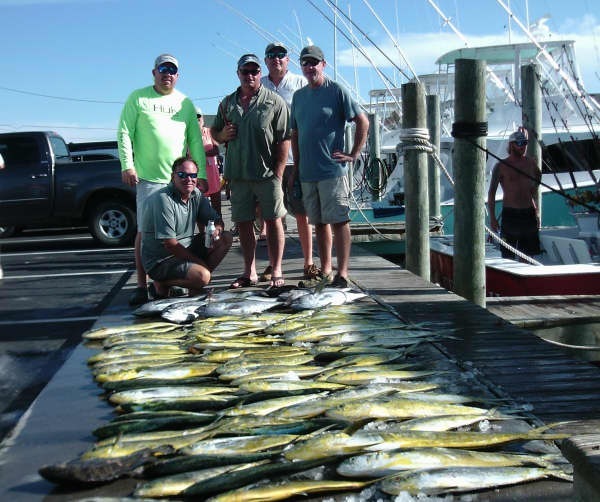 Offshore parties reported beautiful weather conditions, unfortunately the catches were not as plentiful as yesterday. Two Sailfish were released. 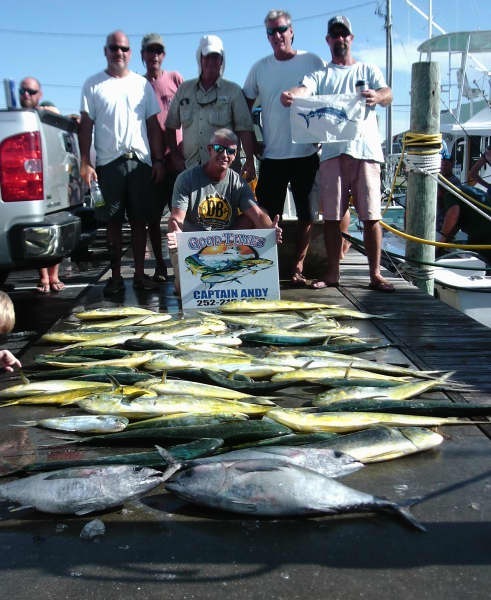 Some Dolphin were caught along with a few Blackfin Tuna and Wahoo. 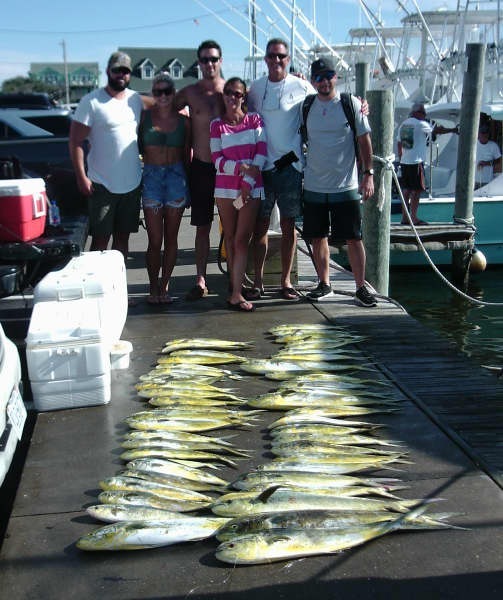 Bottom fishing produced catches of Triggerfish, Vermillion Snapper, and Black Sea Bass. 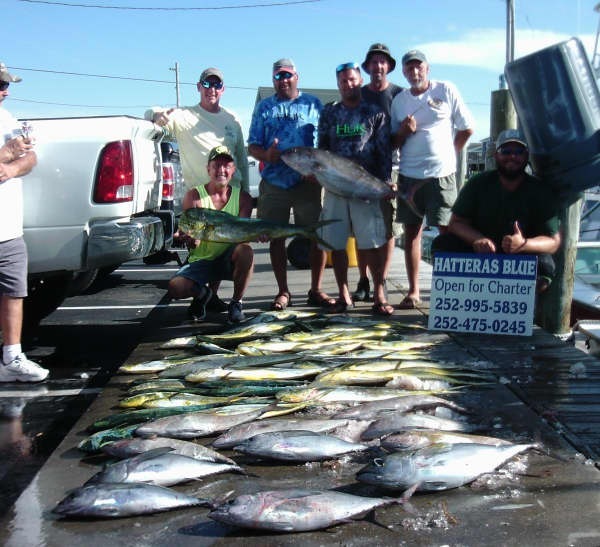 Our belief in Hatteras is that fishing is always good, the catching varies. The weather is supposed to be beautiful again tomorrow, so we'll head out to see what a new day brings. Alec Slemp of Castlewood, VA: Sailfish release on Hatteras Fever II. Another beautiful September day for fishing! 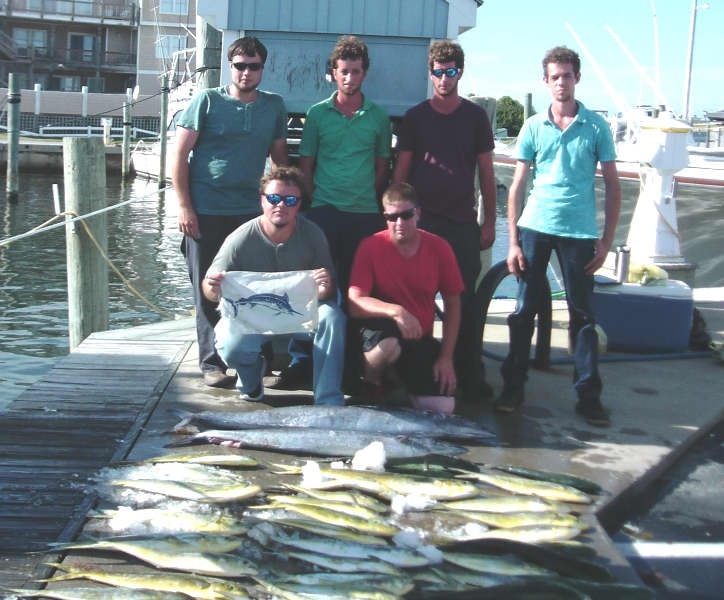 Inshore anglers continue to do well with the Bluefish and Spanish Mackerel. One group went clamming and had a great time splashing around in the Pamlico Sound keeping wet and gathering a limit of clams. 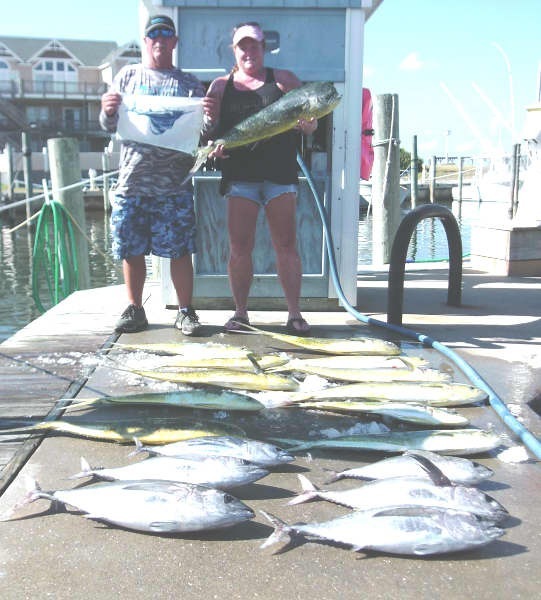 Offshore anglers experienced excellent Dolphin fishing along with scattered Wahoo. The Blackfin Tuna bite was fair to good depending in which direction the Captain went. Two Blue Marlin were released and even more of them were seen. Andrew Kidwell of Henrico, VA: Blue Marlin release on Good Times. Marlin Schlabach of Sugar Creek, OH: 43 lb. Wahoo on Tuna Duck. Joey Shetler of Millersburg, OH: Blue Marlin release on Tuna Duck. Inshore anglers were treated to quite a smorgasbord today. Spanish Mackerel, small King Mackerel, Bluefish, and Albacore kept them busy this morning as well as this afternoon. One boat took a party near shore this morning and go into a Bluefish blitz - check out their catch! Offshore captains reported a good catch with gaffer Dolphin, a good Blackfin Tuna bite, and a few Wahoo. One Sailfish was released and more were seen. It was a gorgeous day with birds on everything - the ocean is alive! barry Hearin of Felton, DE: Sailfish release on Tuna Duck.